No doubt that everyone who works with MySQL server databases encounters situations where database schema and data should be synchronized. When this happens, you start appreciating a reliable database synchronization tool you can use in any complex situation. 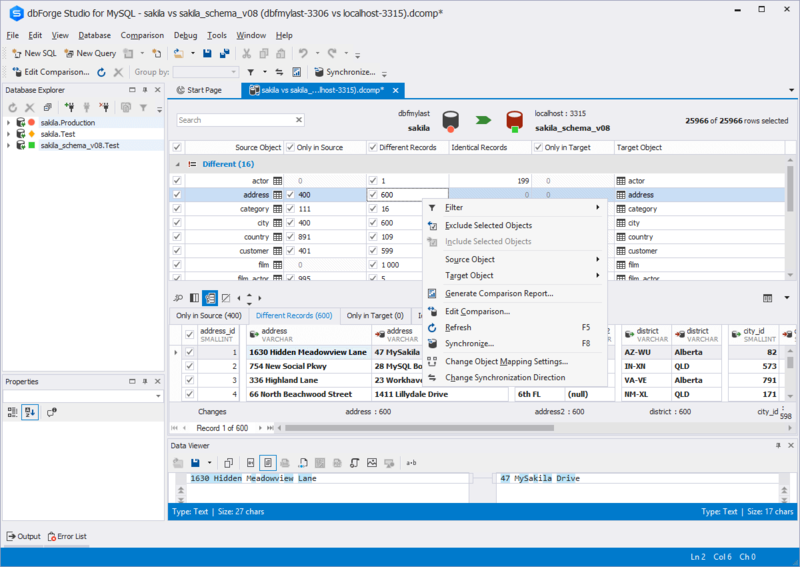 To do this, we offer MySQL Sync tools supplied with dbForge Studio. With the Data Comparison tool, you can compare and synchronize data of two databases. For your convenience, you can do it automatically using the command line. If you wish to view summarized results of data comparison, you can simply create a report. 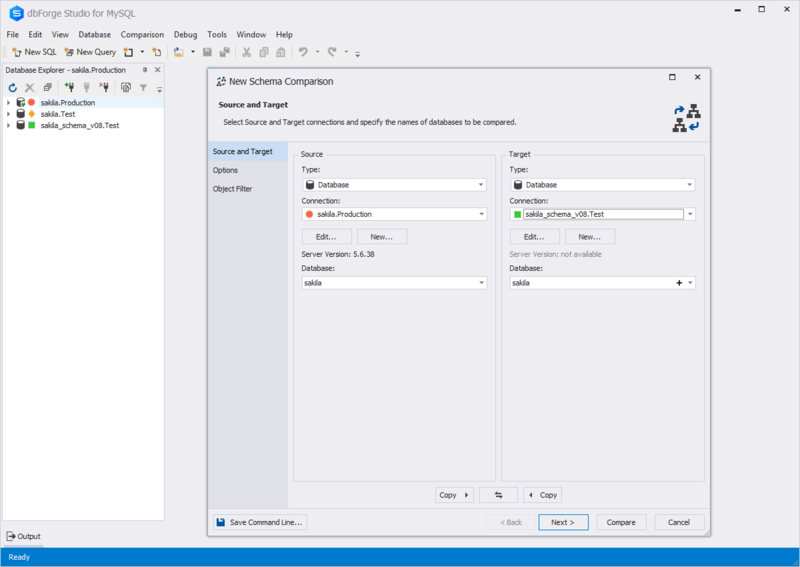 In addition, you can compare, analyze and synchronize data schemas simply use our Schema Comparison Tool built-in dbForge Studio for MySQL. It will help you group and filter comparison results in the result grid or generate a comparison report as well. 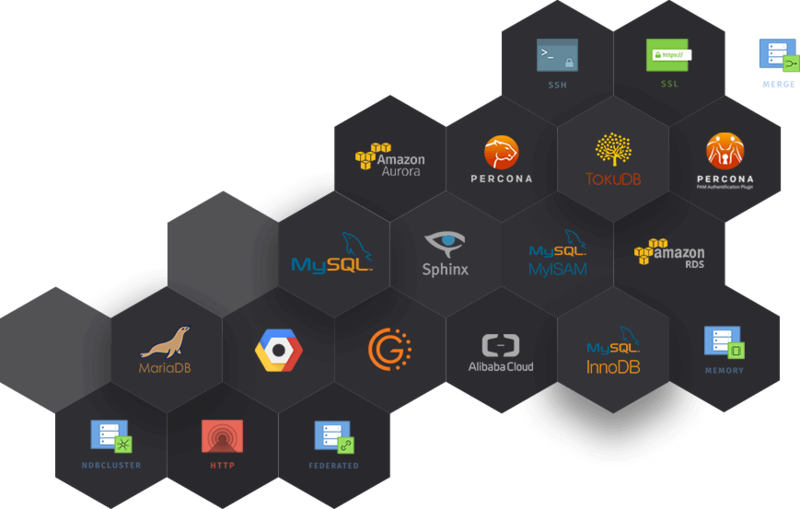 dbForge Schema Comparison tool for MySQL is a tool that simplifies the process of performing MySQL database schema comparison and synchronization. With this tool, you can easily manage comparison results – group and filter them in the comparison grid, compare object DDL, preview a synchronization script to check the correctness of comparison results, as well as generate a report to keep records of schema changes. As a benefit, you have an option to automate schema synchronization using the command line. 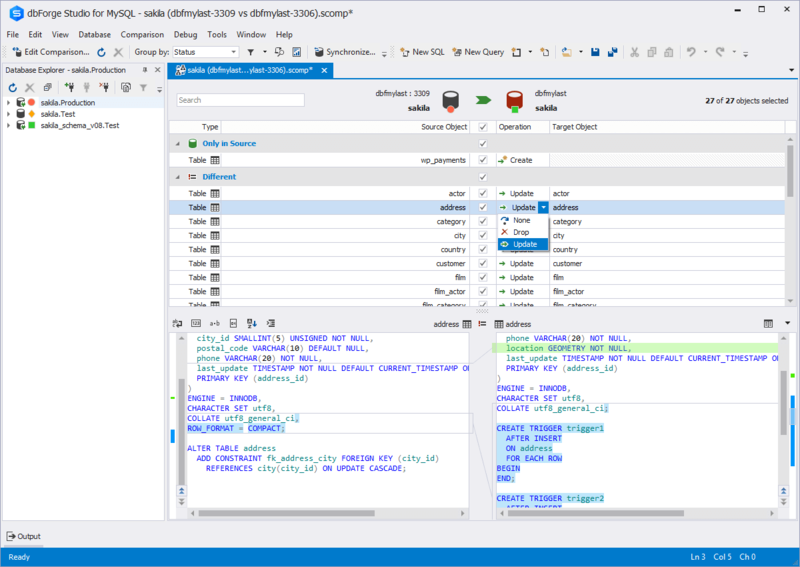 dbForge Data Compare for MySQL allows comparing and synchronizing data of MySQL databases. To run an automatic comparison process, it is possible to use a command line in a friendly and convenient interface. After you compare data, you will get comparison results in comparison grids or, optionally, you may generate a report to view data comparison results. 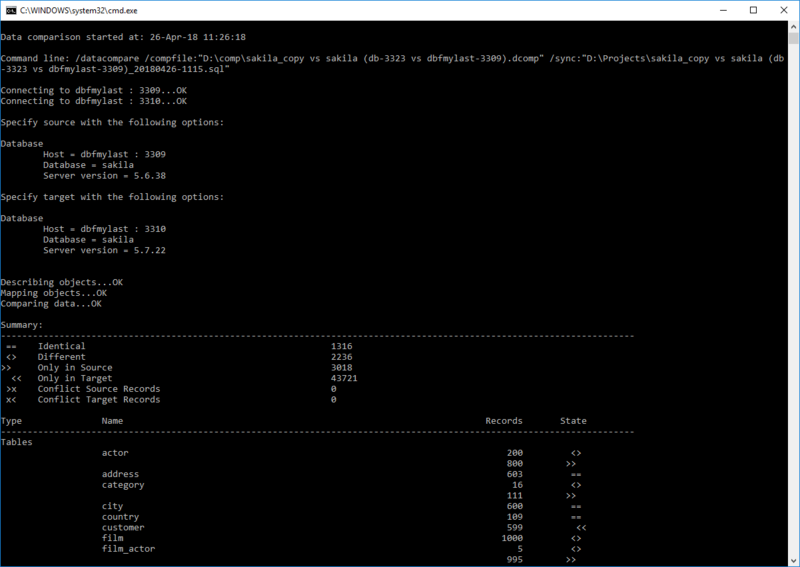 Additionally, the MySQL Data Compare tool provides you with a possibility to automatically run database synchronization with the Windows Task Scheduler. Clear display of schema differences with filtering, grouping, preview of DDL differences in every compared object will give you full control over database schema changes. To track changes, you can use our MySQL synchronization tools to generate accurate comparison reports. After comparing MySQL databases, MySQL data sync tool automatically groups all data differences by status: identical, different, only in source, etc. You gain clear insight into what has been changed without any effort. 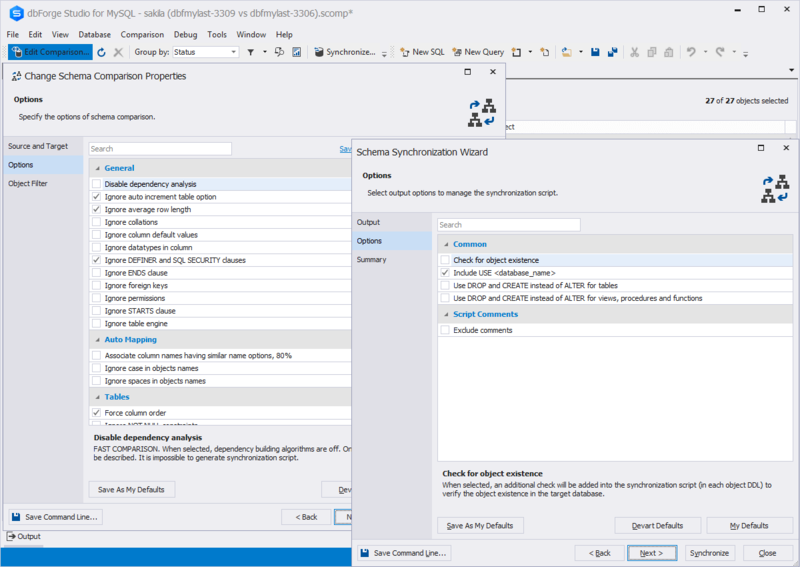 Both schema and data synchronization tools available in MySQL sync tool set offer several ways of database synchronization. If you work with a staging server, you can use one of our MySQL synchronization tools to generate and save a SQL script with schema or data changes to run it later on a production server. Besides, you can execute the script directly against the database. With the command line option and a Windows task scheduler you can set up daily synchronization between two MySQL servers. So schema and data synchronization will be done without your help. To control the result, you can use logs generated by dbForge Studio for MySQL. Now it is possible to compare and synchronize not only two databases but a project with a database as well. 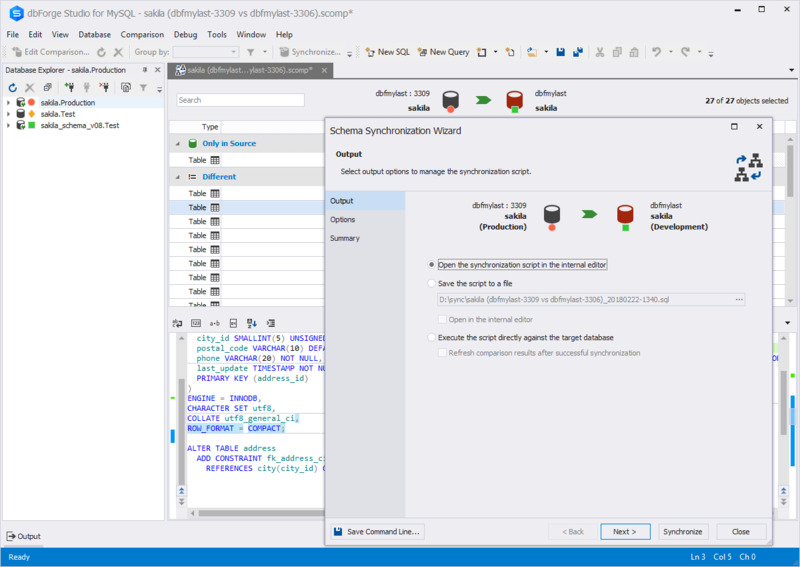 To learn more about synchronization a project with a database, refer to the Comparing Schema and Project topic in the dbForge Studio for MySQL documentation, or watch a video tutorial on the Database Projects page. 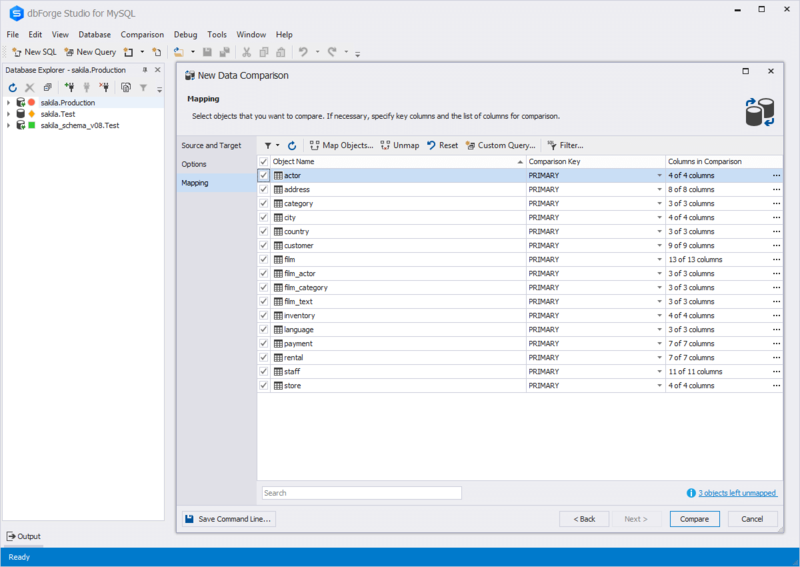 Use the article dbForge Data Compare for MySQL Tour to follow the steps for easy data comparison and synchronization. Visit our blog for detailed information on how MySQL data comparison and synchronization work.